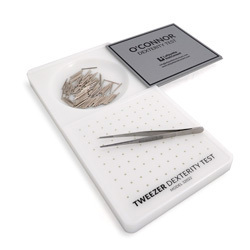 The O'Connor Tweezer Dexterity Test requires the use of tweezers in placing a single pin in each 1/16 inch diameter hole. A high score indicates manual aptitude for work involving the use of precision small tools. Includes 1 tweezer, 100 pins, and detailed examiner's manual.